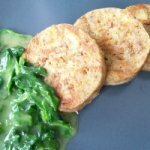 In my search for authentic German recipes that reminded me of the wonderful German food my Oma used to serve, I came across far too many recipes that were difficult to follow or didn’t end up tasting anything like the traditional German food my Oma, or a real German Gasthaus, would serve. Eventually I realized that the best way to collect authentic recipes was to go straight to the source: German cooks. After raiding Oma’s recipe box, I started collecting and testing recipes from friends and family members in Germany, Austria and the US. One by one, I tracked down the recipes I was hunting for, and now I am able to prepare many of the traditional German foods I enjoy so much. Through this site, I am making these easy-to-follow recipes available to you. As my search turns up more recipes I think you might enjoy, I will add them to this site. If you are longing for the flavors of your favorite German dish, and you can’t find it here, be patient. It may show up soon. Or, feel free to contact me, and I will do my best to track it down for you. I hope these German recipes bring you the same joy that they bring me and my family. Although not part of a traditional German breakfast, these treats make for a tasty morning. These are some of the many delicious authentic German soup recipes that are regularly found on menus and in kitchens throughout the German-speaking world. This collection of classic potato salad recipes includes regional variations from throughout Germany, Austria, and the US. These German salad recipes can help you provide a great fresh compliment to any entrée you are preparing. 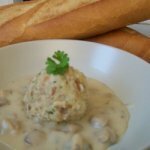 These savory German dumpling recipes make delicious and simple sides for all of your favorite German dishes. 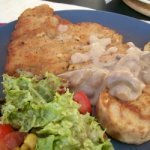 This collection of Schnitzel recipes will help you create a variety of what must be the most widely known and recognizable of all German meat dishes. These German beef recipes (including Sauerbraten, Rouladen, Goulash, and others) offer a cross-section of the many wonderful beef entrees that come out of great German kitchens. Pork Recipes - Roast Pork Loin (Schweinebraten), Pork Cutlets (Schnitzel), plus. These German pork recipes, whether roast pork loin (Schweinebraten), pork cutlets (Schnitzel), or pork goulash, are traditional favorites. These traditional German strudel recipes include both phyllo and yeast dough varieties that can be easily adapted for numerous fillings. This collection of popular German Cookie Recipes will help you to create a delightful array of Christmas treats. An introduction to the variety of German Christmas traditions popular today throughout the world. This form allows you to submit questions ot comments about our site and let us know how we are doing.